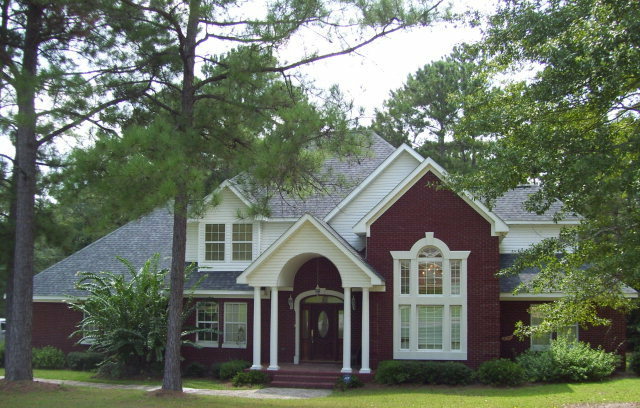 5 bedroom 4 1/2 bath brick home in established neighborhood "The Woodlands". This floor plan has the kitchen open to family room w/ fireplace, gas logs & many built-ins. Beautiful foyer leading to family room. Formal dining and living rm. Large master bedroom & bath w/ hot tub, tile shower & walk-in closet. Another bedroom and bath downstairs that is handicap accessible! Huge deck perfect for entertaining. 3 large bedrooms 2 baths and a bonus room upstairs! Concrete driveway and big 2-car garage. All appliances included. A lot of square footage for the price! Call for your appointment to see.